Let me get this out of the way at the start: I’m a disabled web user, registered as severely sight impaired. 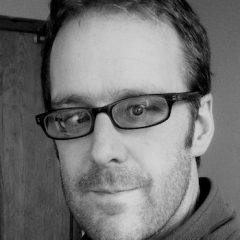 I’m also a web designer and developer – have been for over 10 years. I’m not just a tinkerer: I’ve worked for the likes of Audi, Levi’s, Adidas and even won a few awards for my work with U2. In the early days, like many of us, I didn’t take issues of accessibility as seriously as I ought to have done (I committed my fair share of usability sins and implemented some really bad design decisions). But, I saw the error of my ways, and nowadays I’m a loud advocate for good standards and better accessibility. And, as both a disabled web user and a web practitioner, I think I have some useful insights to offer on how we might make the web a more accessible place, not just for those who are disabled, but for everybody. There have been fantastic advances in improving access to the web over the past ten years or so. The wider adoption of web standards by both browser vendors and web practitioners has bought huge benefits to all types of disabled users. These advances have helped to inform trends in web design and development in a myriad of positive ways. Personally, I’m finding that my web experience is steadily improving thanks to these adoptions, which is a fantastic thing. There is still some way for us to go though. 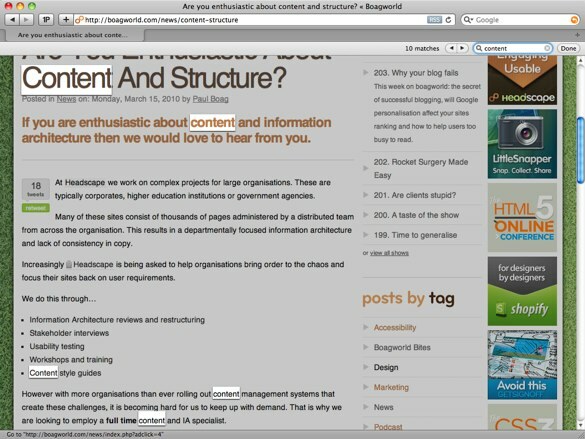 I still occasionally stumble across high-traffic sites which are terribly inaccessible: code soup which makes a site unintelligible to screen readers; design treatments which bewilder anybody with learning difficulties; tiny hit areas which make for horrible target practice amongst those with motor disabilities. These aren’t old, creaking relics of a by-gone cyber-era either: they are new, high-profile commissions. Sure, not everybody is signed up to web standards, nor is every web designer or developer experienced enough to appreciate the importance of accessibility. 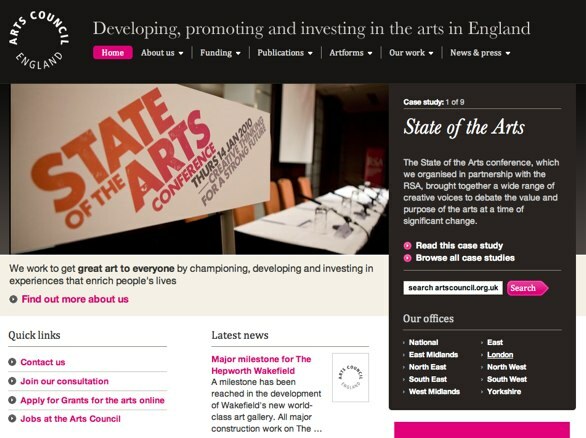 But from my experience, it seems that public sector and cultural organisations are the ones who are failing the most. This always baffles me a little, as you’d expect publicly-focused bodies to have a commitment (and in many cases be required) to ensure accessibility to all. Ignoring disabled members of society in the physical world is wholly unacceptable, so why do we still tolerate it in our virtual world? The fact is that not every disability is the same, and the acuteness and intricacies of a disability can affect people in so many varying ways. Well, part of the reason, I think, is due to a slightly skewed way we think about disability. It is easy to fall into the trap of thinking of someone with a disability as part of a generalised group: someone who is blind, who is deaf, who is a wheelchair user. The fact is that not every disability is the same, and the acuteness and intricacies of a disability can affect people in so many varying ways. This misconception makes it a complex and confusing subject to understand, especially for people with deadlines. But I think there’s something else we need to address. Our industry isn’t innovating enough. 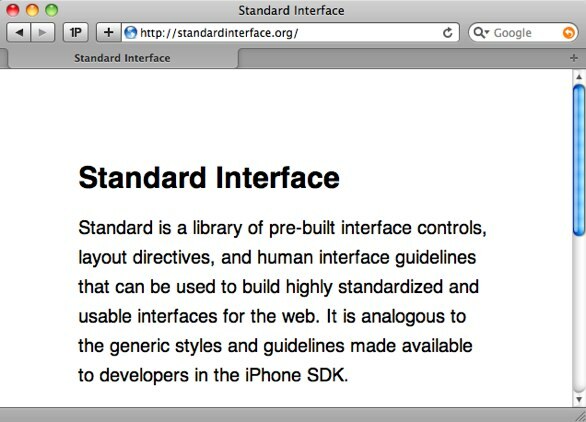 We’re simply not being intelligent enough with our design of the web. Now, that reads as quite a bold assertion, so I’ll try to explain where I’m coming from. I’m a firm believer that good design should be both beautiful in it’s aesthetics and in the way it functions. But it seems that a lot of the time, when it comes to designing for the web, aesthetics and functionality are treated as two very separate disciplines. I’m generalising, but I’ll bet that the approach to the design of most web projects is still either: a great visual style which needs to function well; or a functional architecture which needs to look good. One generally informs the other. I’d like to see the wider adoption of a new, emerging type of web design, where style and function are embraced as a single, integrated discipline. Gone are the days where a designer’s job stops when they hand over a Photoshop mockup to a site builder. And similarly, gone are the days when site builders try to design in the browser and then a visual style is conjured up around markup. Both of these approaches have their benefits, but equally, both have their failings. Can we not be a bit more inventive? I think this is where accessibility could step in. 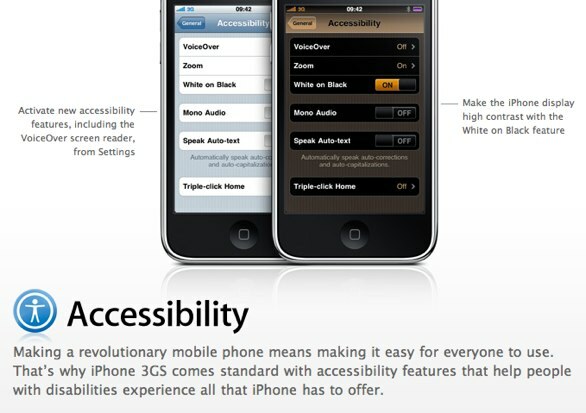 I think accessibility can be a killer tool for some amazing design. But it needs us to look at it in a new way. As much as any of us claim to take it seriously, how often do we think about how it can be done better? The tendency is to just tick the boxes and then move on to another pressing task. Rather than being a secondary consideration in the design and build of our web experiences, we can better use the disciplines of accessibility and usability as tools to inform and inspire beautiful aesthetics and functional design. Accessibility should be embraced as a way to allow us all to adapt our online experience to fit the way we use the web. Good accessibility doesn’t just have to be something which assists people with a disability. We need to flip that idea on it’s head. Accessibility should be embraced as a way to allow us all to adapt our online experience to fit the way we use the web – disability or no disability. Better access to the places we visit on the web doesn’t just benefit people who are disabled, it benefits everyone. Apple are a rare example of a company who take good design seriously and who are already doing amazing things in this field, albeit with installed software. I have very low vision due to a rare form of albinism. My distance sight is really bad; I wouldn’t be able to recognise your face across a room. But my near vision is exceptionally good; I excel when working with pixels and detail. I predominantly do most of my work on OS X because it has so many low-level accessibility aids built right in: I can zoom the screen with keyboard shortcuts; well-adopted UI guidelines make it easy for me to understand a new app; standard controls and focus help me to navigate without a mouse; finding files, running applications and searching can all be done swiftly and easily using the keyboard. I adopted an iPhone for the very same reasons: not because I’m an Apple fanboy, but because it brings with it the same accessible features as my operating system, features I’ve struggled to find in any other mobile device. For me, these are amazing productivity tools. I tend to work faster and with more efficiency than my well-sighted peers, and that’s purely down to my use of accessible tools. I’ve adapted my working world to not only achieve an equal footing, but my adaption allows me to be more productive than many able people. But these enhancements haven’t been developed for the sole use of people with a disability. They are elements of good, well-considered design, beautiful in both aesthetics and function, which are available to all. Try it right now: if you’re using a fairly modern version of Safari, hit CMD-F, then start typing a word, and you’ll see a perfect example of what I mean. If you’re using another browser, chances are you’re missing out on the advantages of a piece of simple, but clever, assistive design. Assistive accessibility means providing add-on tools which help people. My local Co-op print braille labels on their wine bottles: a nice bit of assistive design which helps us visually impaired lot choose our tipple. A worthy amount of effort goes into the transcription of subtitles and closed captions for TV programmes and DVDs: a service many of us don’t use, but which is an invaluable assistive tool for the hard of hearing (and incidentally a tool which is only now appearing as a feature in mainstream online video services). Adaptive accessibility is about building things into our everyday world which aren’t used by everybody all of the time, but are available as a helper to everybody all of the time. It can be something as simple as a handrail on a stairwell: the more sprightly among us may bound up stairs two-at-a-time; those who are more elderly need the extra support; sometimes children use it; if you’re tired, lazy, carrying something heavy you might use it. You adapt your behaviour through use of the tools around you, depending on all sorts of factors. I see no reason why this analogy can’t be translated into our experience of our online world. We’re moving away from the desktop, to devices in our pockets, on our laps, in our cars. We can go online virtually anywhere, with different distractions; different demands for our attention. We’re moving away from navigating with the keyboard and mouse, to using touch, gesture, using our voices, using our ears. This might come as a surprise to you, but us “disabled” lot are way ahead of the game when it comes to alternative ways to navigate the online world. So how do we start building more adaptive online experiences? I do not have a simple answer as to how we achieve this, I’m merely posing the question and acting as an advocate for the discussion of ideas. Perhaps it involves rationalising the UI design of the web (the adoption of iPhone design conventions shows an early example of what this might mean); perhaps it means decoupling data and presentation even more than we already have, and looking at a more ubiquitous approach to design; perhaps it means we’ll see the emergence of new creative workflows, and a new breed of designer (there are plenty of “creative technologists” emerging who fit the mould). Perhaps we’ll invent new tools, services and devices which change the way we experience, and perceive, the web. Or perhaps we’ll just keep plodding on for the next ten years, pontificating and prevaricating, waiting year on year for the ratification of standards, stifling our creativity, innovating by increments, never really being progressive, never being bold. History has taught us that freedom and inclusion can reap huge rewards for all members of our society. The world wide web has shown us an inkling of it’s potential. But unless we take a good, hard look at one of it’s core principles: access for all – then that potential may not have a chance to blossom.